Ever wish you could try new products out before you bought the full size box or case or however they come? There are tons of monthly boxes that cover things you love: books, makeup, fandom goodies and even jewelry. But what about food and health items? 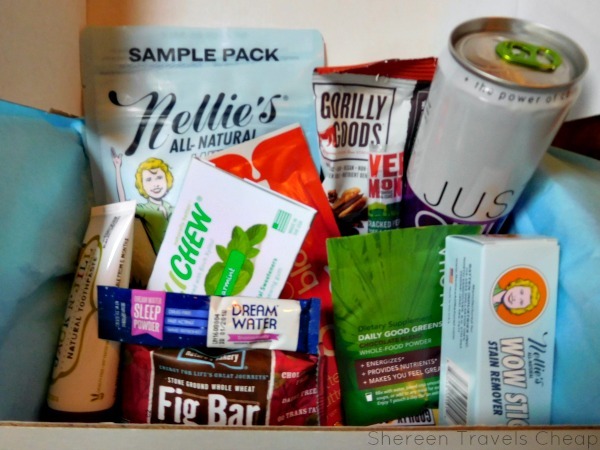 While you can request samples of some items on their websites, wouldn't it be fun if you just got a box full of samples that came right to your door? I mean, I have gotten shampoo and toothpaste trial sizes before, it has taken a long time to show up and it's just one thing. Now, you know I use trial sizes to take with me on my trips, because I don't need a full-size lotion or foundation when I'm only going to be gone for a week. I'd love to also do this with food and other items. 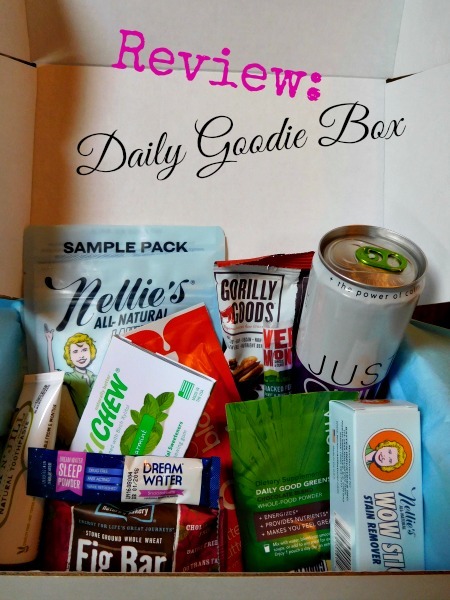 Daily Goodie Box is a free service that gathers awesome new products and puts them together to send out to consumers who want to try them out. Shipping is free. All that's asked of you is to review the items you've received in order to be eligible to receive more boxes in the future. My Daily Goodie Box was packed full of cool stuff. Things I'd be excited to take with me on a trip and also use at home. There were a dozen items (average is 10) and i was super excited to try them out. 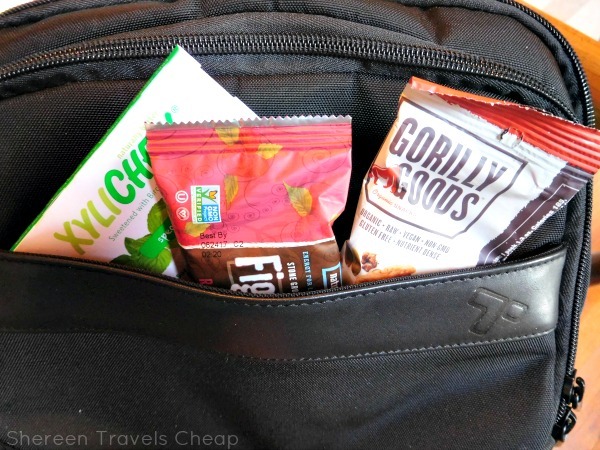 A few of the snacky things were perfect for my carry-on's front pocket, allowing me to have something to munch on while on the plane. 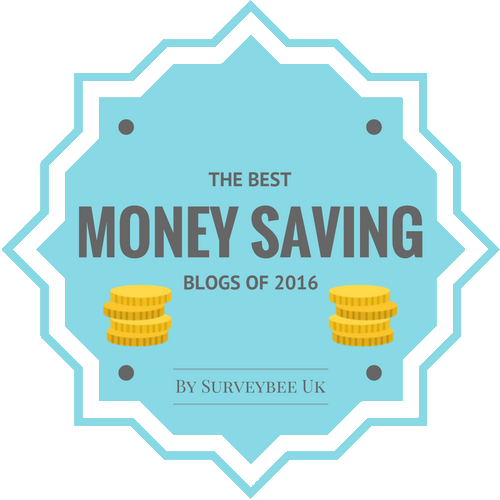 You also know that I'm a "fan" of doing laundry on my trips in order to pack lighter and save money on baggage fees. 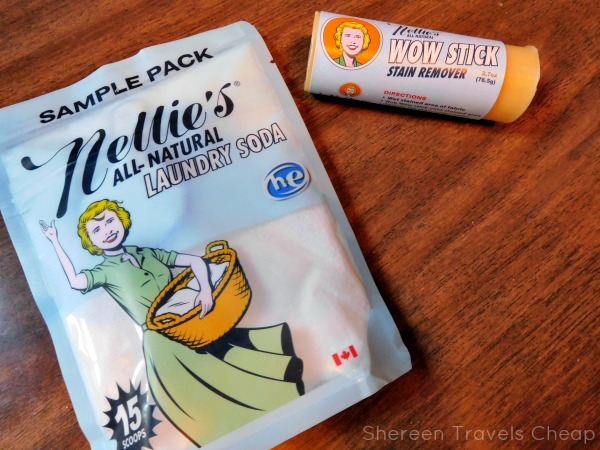 My DGB came with the fantastic Nellie's laundry soap, which works in high efficiency machines, so it goes further. I like bringing my own detergent, so I save money. Having dry soap is easy to handle and doesn't mean I have to add something extra to my liquids bag. I also received a full-size stain stick. Now I can get that food stain out of my shirt and do it as naturally as possible. You can purchase Nellie's in tablets as well, so there's no measuring required. Do you like jerky and stuff like pepperoni sticks? I do! My box came with a beef and pork stick from Vermont Smoke & Cure. I immediately pulled it out and chowed down on it. So good! The next time I hit up Target, I found a bag of these sticks and snatched them up. 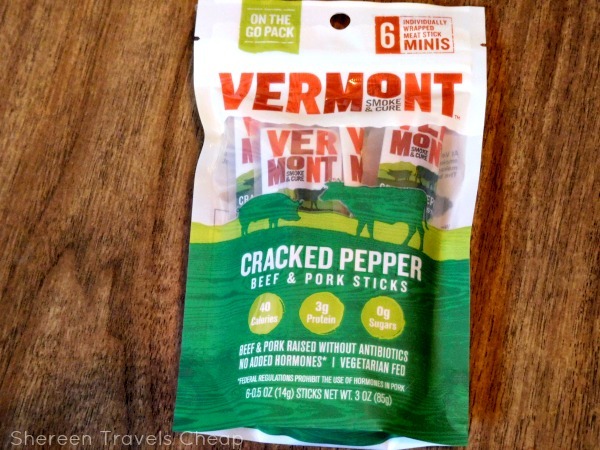 They make great snacks for work, plus are full of protein with nothing gross added to it. They aren't cheap, but are affordable enough that I'm willing to grab a bag every now and then as a special treat. It's been a while, but I once did a review of Dream Water on a trip, because my first day in a new place is always a challenge to get to sleep, no matter how exhausted I am. 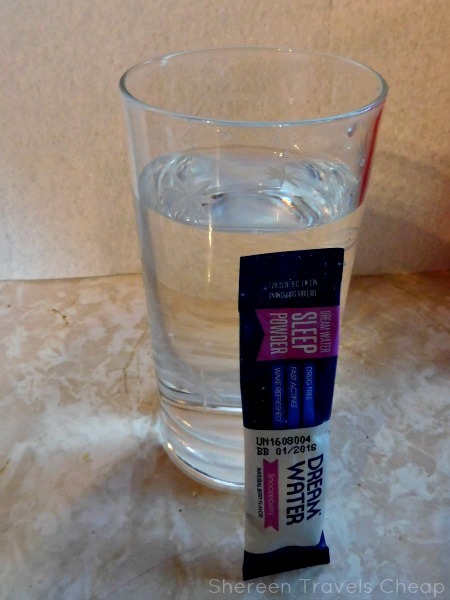 Dream Water gives you that extra push to fall asleep with all natural ingredients like melatonin. It's hard to travel with Dream Water, because it's a liquid, and buying it at the airport can be prohibitively expensive if you can even find it. Being able to purchase Dream Water in powder packs not only save money and space, but it's easier to bring more than one with you if you have trouble sleeping more than just the one night or there are several of you who need help falling asleep. 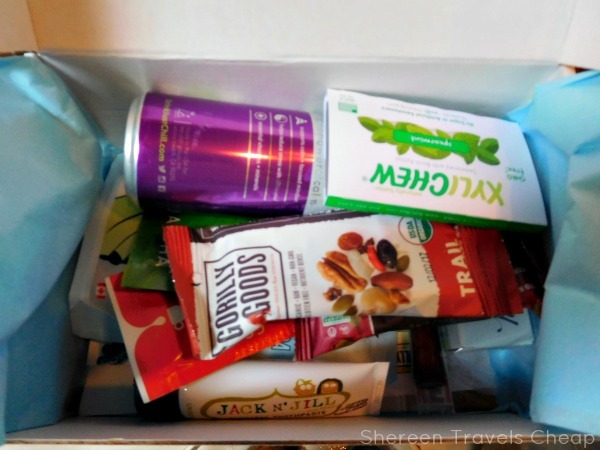 Since you don't have anything to lose and only free products to gain, go sign up for Daily Goodie Box and wait for awesome stuff to show up at your door. Now, there's no guarantee that you'll get a box, because of limited quantities, but if you do, try your products as quickly as possible so you can give your feedback. This feedback is shared with the companies that are sharing their products with DGB (and you). Like me, you may find some new favorite things, for travel or otherwise. What's the best free trial product you've ever received? Disclaimer: I was provided with a Daily Goodie Box for the purposes of this review, but all opinions are 100% mine.